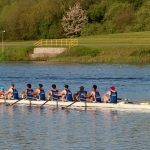 After a good first day at BUCS regatta a men’s beginner eight, a men’s champ coxless four, a women’s intermediate eight and a women’s beginner four were racing on the second day of the competition. BUCS started early for the beginner squad with their time trials in the morning. 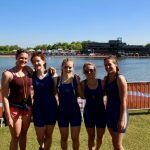 The beginner women’s four consisting of Maddie Brown, Melissa Johnson, Abbie Cook, Elisavet Palaiologou and coxed by Lizzie MacCann took on their BUCS race with a lot of excitement after watching the rest of the squad the previous day. 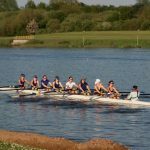 As this was their first regatta experience they were happy to find that the marshalling time was less than it was at BUCS Head. Accompanied by shouts from the rest of the squad they hit their time trial hard and got a place in the C-final. Melissa, who took on rowing just 3 months ago was excited to see how far she had come in such a short amount of time. Thereafter, it was the beginner men’s turn. The crew was coxed by Naomi Coleman. Stroked by Lukas Schroth, Wei Chen Shin, Shabaz Kamran, Roberto de Isidro, Chris Homes, Wilson Sandengu, Abdel Abdalla and Zak Evans were looking forward to their time trial. The crew has been rowing together since the start of the year and has since found a lot of speed and progressed massively. 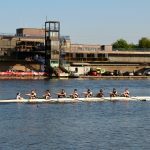 With their goal to reach the A final in mind they pushed through the time trial to reach the A/B semi-finals in seventh place after the time trial. The crew was very happy as this was the first step towards the goal. Afterwards, the men’s champ coxless four consisting of George Stewart, Ali Douglass, Alex Law and Giovanni Morescalchi had their time trial. Earlier in the morning, the crew came down to prepaddle on the river to set them up for the time trial. 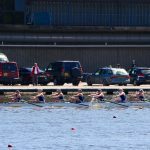 As only 12 crews were entered in their category, they were already guaranteed a place in the repechages, hence they tried to save some energy by not going down the course on max power. Last of the squad to time trial was the intermediate women’s eight. 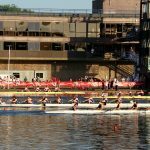 The crew coxed by Lizzie MacCann had been working together in that set up since the training camp in Peterborough, therefore they knew how to execute their plan. Ellie Stevens, Anika Piezka, Megan Pearson, Sophie Hossack, Megan Moloney, Maddie Gardner, Fiona Norris and Jasmine Bone warmed up on land prior to the time trial which proved to be valuable as there was a big queue due to delays from previous races starting at the 500m marker. The crew kept warm throughout this longer marshalling period by doing different exercises. Once it was time to start, everybody was buzzing. The race went very well and they made it right into the semi-finals. In the afternoon the semi-finals started. 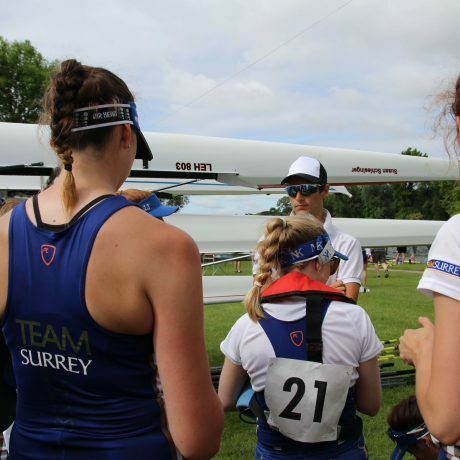 Having been through their race strategy for the side by side race with both head coach Sam Tuck and coach Iona Riley, they were mentally prepared for the race. Nevertheless, they were quite nervous as they had to get it right in order to get into the A-final. They knew they could do it from previous 2km pieces against other crews in Dorney Lake. They took this determination in the semi-final and finished in third place which meant they went into the A-final. The crew was delighted and took a lot of confidence from it. Then it was the turn of the men’s champ coxless four. The crew also did an extensive warm-up in the shade so as to decrease the sun exposure as it was very warm. As this was a championship event only the first two fastest crews would progress from the repechage into the A-final. The crew had a hard race, battling for the second place in the final. Sadly, they narrowly missed out on the final by coming third with a 2 second margin to the second place. The women’s intermediate eight was very motivated by seeing how well the beginner men performed. They took this determination into the race. Despite having a bit of stress boating, due to sharing blades with another crew, they coped well with it and were on time in the marshalling area thanks to the rest of the squad helping them . Up against a field of other top crews, they had to face tough competition. The crew made it into the B-final which they were content with. After the semi-finals, the beginner women’s four had their C final. Building on the work they have done in their crew over the past months, the girls had a great race and got their first chance of experiencing intense side by side racing. The crew finished 16th out of 50 crews which is a great result. While the beginner men were racing down the course in the A-final, the whole squad was there to support them. The senior women were getting ready to boat for their final while the rest were dispersed along the lake. The beginner men performed solidly. They finished 5th in the country which is great to see. All of the boys were very happy and so was the rest of the squad including the coaching team. This is the best placing any Surrey crew (not consisting of HPASS athletes) has achieved in club history. While the rest of the squad was celebrating with the boys, the intermediate women’s eight made their way up to the start of their B-final. Taking in feedback from the coaches about their previous race, the crew improved from the semi-final. Throughout the whole race, all racing crews stayed together closely. Accompanied by encouraging shouts from the team they raced for every place. In the end with a .73sec margin they placed fourth in their final, ranking them 10th in the country. It was a tight race but the crew was happy with their performance. To sum up, day 2 of BUCS regatta proved to be a step up from the first day. The beginner squad performed amazingly and concluded their racing for the weekend. The support from the rest of the squad brought everybody even closer. The big USBC family was already looking forward to the next and last day of racing.